Let me let you in on a little secret. New Brunswick, an already dynamic and exceptional dining destination, just got even better. No, more parking lots weren’t added, but what has happened just might get you on the turnpike and over to the home of the Scarlet Knights! Under new Executive Chef and partner Zod Arifai, Daryl Wine Bar Restaurant has reopened and is ready to please. 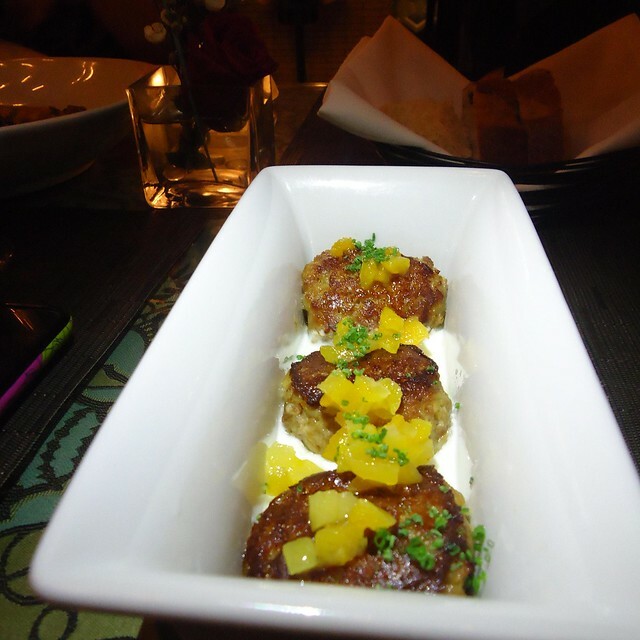 Arifai, most notably of Montclair’s Blu, has transformed and updated a key piece of the New Brunswick dining puzzle. As of December, Zod has taken over the reigns of both the kitchen and atmosphere of this New Brunswick hot spot. Décor changes have improved the tranquility of the space and made for a more casual yet trendy feel. His menu features eye-catching items such as seafood dumplings ($12) in a spicy coconut broth, duck meatballs ($12) with yogurt and apricot, fettuccine with lobster, pumpkin and almonds ($26), various steaks ($28-$38) paired with potato gratin, and Mahi ($26) with pineapple, jalapeno, black beans and baby bok choy. The impressive wine list offers plenty of 2, 4, 6, or 8 ounce glasses for your enjoyment, whether to sample or pair with dinner. Wine by the bottle is also offered if you are sticking to one variety of vino. Recently, I was fortunate enough to be in attendance at Arifai’s Special Intimate Media Dinner where my husband and I were able to see first-hand how this restaurant has reimaged itself. As a Rutgers graduate, my husband has had the “Scarlet Fever” for quite some time now and I, as his wife, have caught a case of it too. Most significantly though, the restaurant scene has captured my heart. So being that I’ve dined at almost every venue, I realize the standards that each place has to meet. And from my experience, some fall below, some hover, and some excel. To say it simply, Daryl excels. We began the evening with many appetizers to share. The tuna tartare ($14) was executed well and beautifully plated. The fish was fresh and simple, which allowed us to admire its quality. The duck meatballs were exceptional. Juicy, seasoned just right, and portioned perfectly for a beginning course. Another star of the appetizer round was the seafood dumplings. The delicate nature of the pasta was incredible while the seafood placed inside was bursting with flavor. Not to mention, the transformative nature of the broth: it began sweet from the coconut then ended with heat and spice. It was a dish that clearly displayed Arifai’s talent and attention to detail. The pasta course was next and again I was delighted. My favorite though was the goat cheese ravioli with wild mushrooms ($22). I feared a minimal goat cheese taste; however I was blown away by the richness and flavor each pasta pocket held. The brown gravy-like sauce which coated each ravioli was also of note; creamy, silky and deep in flavor. 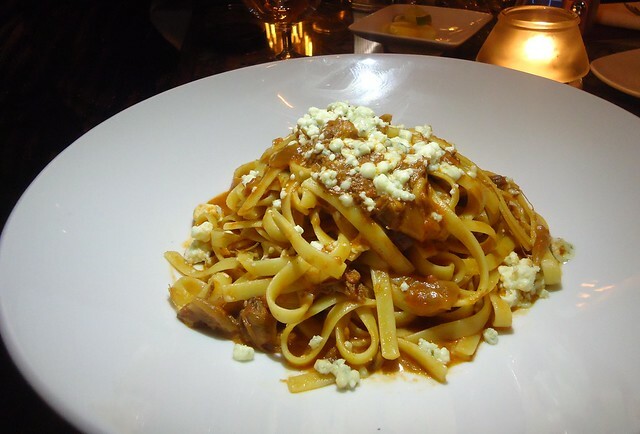 One other pasta dish that was quite enjoyable was the pappardelle with venison Bolognese and crushed chestnuts ($22). A stick-to-your-ribs kind of dish that satisfied the moment I took my first bite. Entrees hit another high mark for me. I ordered the tuna with napa and shiitakes in a ginger sauce ($26). Seared perfectly, the meat was ever so tender. Although the sides were light, they did allow for the fish to be the focus. The filet mignon ($36) my husband was served was cooked to a text-book medium-rare. The crust, or if you will, char, was simply amazing. It offered flavor yet also contrasted the inner steak very distinctly. On the side was a potato gratin, more to me like a scalloped potato though. Nevertheless, it was piping hot and oh-so-creamy. Over-salting was a slight issue with the steaks served, however I did not see this first-hand. After clearing off our table, dessert menus were presented to us and we all, somehow, made room! And thank goodness we did, they were unbelievable! 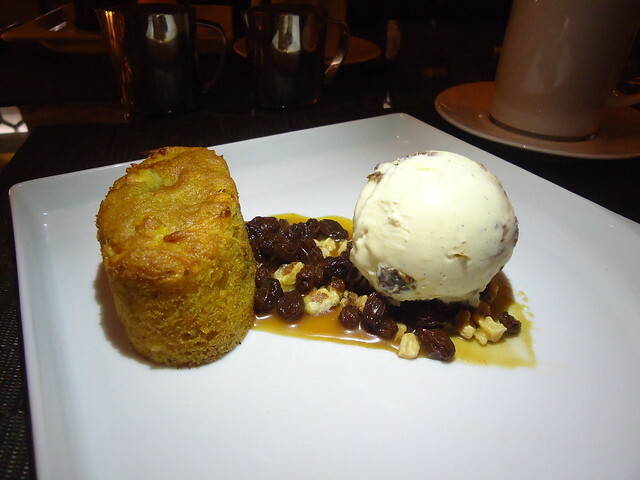 I was totally in love with my butternut squash-apple cake ($8) with walnut-raisin ice cream. The little loaf cake was beyond moist while the sprinkling of extra walnuts and raisins displayed the kitchen’s thoughtfulness when plating. The chocolate cake ($9) with peanut butter ice cream was outstanding. It was served warm and sported a fudgy molten-like middle that, when spooned with the peanut butter ice cream, created pure bliss. I was truly in awe, not only with the quality of the cake, but with the ice cream as well. The other dessert that had many smiling was the frozen mocha mousse ($9). And although I was not a particular fan, the dish was commendable in that the bottom was creamy and solid yet the top was brothy and silky. A dynamic dish that, if you’re not a traditional cake-eater, you would enjoy. So after four courses, four hours, and probably well beyond four times saying, “Wow, that’s good,” I was very pleased with the new Daryl. Even the flow of customers on a rainy evening had me admiring Arifai’s new digs. This leads me to finish with a push for you to check out this place, make a reservation, get there early to enjoy the wine room, and sit back for an excellent meal.